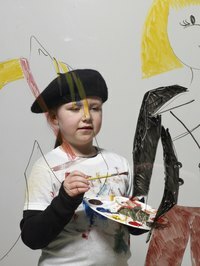 Help your little Rembrandt feel like a real artist with a painter's beret. You could knit or crochet a beret, however a sewn beret made from a durable material, like denim, is better able to stand up to rigorous play, paint spills and machine washing. Give this hat with a new apron, drawing pad or paint set to get your young artist started. Draw two 10-inch circles in the fabric. Draw a circle 7 inches in diameter in the center of one circle to form a doughnut. This is the opening of the beret. Cut out the circle and doughnut. Stack the material right-sides together and sew a seam along the perimeter of the circles 1/4 inch to 1/2 inch from the raw edge. Turn the cap inside-out through the opening of the doughnut piece. This completes the top of the beret. Cut a 2-inch wide, 23-inch long strip of material. Fold the strip in half lengthwise and press it. Open the strip. Fold the long sides of the strip toward the center fold forming a 1/4 inch flap. Press the material. Fold the material along the center crease to form a length of bias tape. Place the bias tape on the raw edge of the opening so that the edge is sandwiched in the bias tape at least 1/4 inch. Start 1 inch from the beginning of the bias tape and stitch along the folded edge of the bias tape. You will pass through five layers of material: the exterior of the bias tape, the 1/4-inch flap, the hat, the 1/4-inch flap on the opposite side and the interior of the bias tape. Stop sewing 2 inches before you meet the beginning of the bias tape. Pin the remaining bias tape in place where it will be sewn. Overlap the beginning and end of the tape 1/2 inch. Trim the excess. Mark the bias tape where it overlaps. Open the tape. Pinch the ends together and lift them away from the hat. Keep the ends on the inside pointed toward the hat. Sew along the marks to attach the beginning and ends of the bias tape. Trim the excess. Refold the bias tape and pin it along the perimeter of the beret opening. Sew along this opening to complete the hat. Reinforce the hand stitches with a machine. Remove the thread from the hand stitches. Use a mid- or heavy-weight fabric for this project. Select a fabric that can maintain its shape. To test the rigidity of the material, drape it over an overturned bowl and observe the drape. Select a fabric that drapes with the bowl but maintains its shape, such as denim or felt. For a more flexible fit, select a stretch fabric. Use a thin, elastic cord instead of making bias tape to line the opening. Increase the diameter of the circles, but not the doughnut or opening, to make the hat poofier. Experiment with mixed-media by using a different material for the circle and the doughnut.